It is possible to complement and even replace lengthy instructional manuals with simple to use process maps. 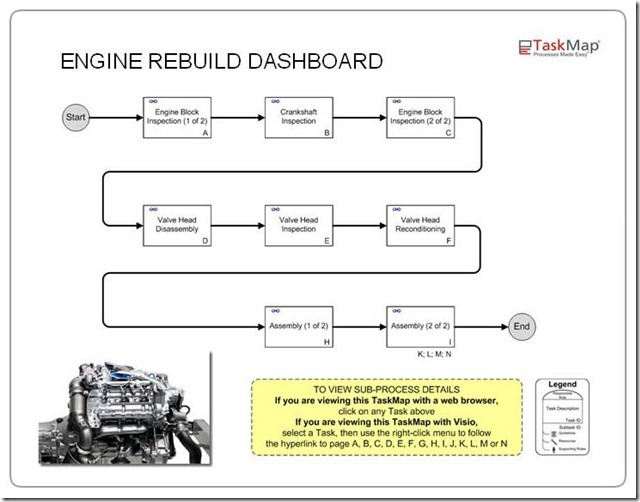 This example focuses on an engine rebuild and replaces a 100 plus page manual with a 14 page linked process map. The engine rebuild process map was created to show how Process Maps can be used as a guide for mechanical repairs. By using TaskMap to create directions for a repair procedure both time and money are saved. Process maps can be used to describe how a process is meant to be done; creating a best practice standard for how the repair is done. The repetition of doing a repair in a predetermined process greatly cuts the number of mistakes made and significantly reduces the amount of time that the repair takes. Costs for mistakes made during a repair usually eliminates any profit made from the repair, as well as costs in equipment down time. Simpler to follow, precise instructions: By using TaskMap, all the steps in a process are in visual format eliminating unnecessary word clutter that comes with a text based repair manual. A picture is worth a thousand words. A technician is able to glance at the TaskMap, then complete the Task(s), and glance back at the TaskMap to find the next one with ease. Preparation made simple and less wasted time: All tools and resources are outlined within the TaskMap allowing the technician to have everything prepared for the repair. TaskMap reporting features allows the user to isolate and display resources on one page. The reporting feature can be used to isolate and display guidelines. Time spent looking for specifications and rummaging through toolboxes is reduced significantly as the Technician is better prepared for the repair. This feature also allows the technician to ensure all necessary parts are readily available prior to attempting the repair. Shorter repair cycles with improved efficiency of Technician time: The hyperlinking function allows for accessibility to pictures, documentation, repair orders, websites, etc… By creating hyperlinks within the TaskMap, the Technician can use TaskMap as a dashboard to guide him/her to any forms or other product specific information. The task completion time shows specific task times associated with each task. This allows the technician to allocate the amount of time to each task as well as set a time goal to beat. This function is useful in industries that use a flat rate wage (when the amount the technician is paid is predetermined independent of completion time). Flat rate is the standard pay for automotive technicians. The guidelines function allows for any tips on performing a task to be easily identified. Time is money and any tip a technician discovers can be relayed to other technicians viewing the map. Less down time: Using a TaskMap flowchart for a repair process creates a standard for how a repair is done. The repetition of doing a repair in a predetermined process greatly reduces the number of mistakes that are made. The cost for mistakes made during a repair usually eliminates any profit made from the repair, as well as cost the customer in equipment down time. Repetition also and greatly reduces the amount of time that the repair takes. The sooner the technician finishes the repair, the sooner he/she can start the next. Paper and storage savings: TaskMap allows repair manuals to be displayed from any computer. This eliminates the need for paper versions on repair information. This also allows for a portable manual using a laptop or tablet PC.